Physiotherapy/Physical Therapy is a health care profession that aims to develop, maintain and restore maximum functional ability throughout life. It helps in restoring normal body function and preventing disability arising from disease, trauma or injury. PTs utilize an individual's history and physical examination to arrive at a diagnosis and establish a management plan, and when necessary, incorporate the results of laboratory and imaging studies. Physical therapy has many specialties including cardiopulmonary, geriatrics, neurological, sports, manual, orthopedic and pediatrics to name some of the more common areas. Use various physical therapy modalities such as both superficial and deep heat and cold as well as hydrotherapy techniques, electrical stimulation, traction and massage for pain relief. Physicians like Hippocrates and later Galenus are believed to have been the first practitioners of physiotherapy, advocating massage, manual therapy techniques and hydrotherapy to treat people in 460 B.C. The earliest documented origins of actual physiotherapy as a professional group, however, date back to 1894 when four nurses in Great Britain formed the Chartered Society of Physiotherapy. Other countries soon followed and started formal training programs, such as the School of Physiotherapy at the University of Otago in New Zealand in 1913, and the United States' 1914 Reed College in Portland, Oregon, which graduated "reconstruction aides." 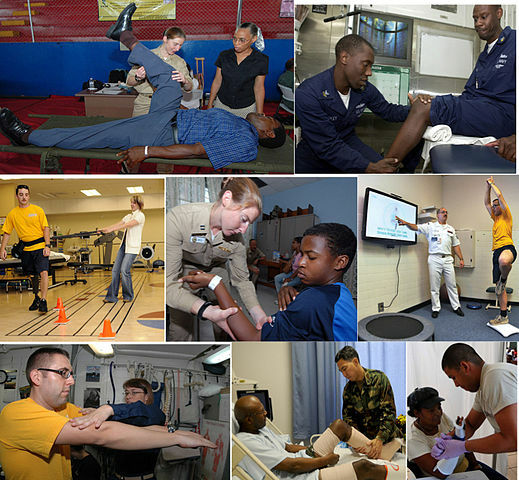 Physical therapy practice in the United States evolved around two major historical events: the poliomyelitis epidemics of the 1800s through the 1950s and the effects of the ravages of several wars. Marguerite Sanderson and Mary McMillan were the first two individuals involved in the training of "reconstruction aides" responsible for caring for those individuals wounded in World War I.